A slow growing rounded tree. The horizontal branches tips tend to curve down, giving the tree a graceful, lacy effect. 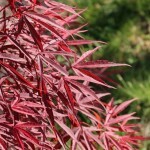 The foliage is red and strap-like, and matures to bronzy red by late summer. The fall color is a bright red. The delicate foliage inspired the name. 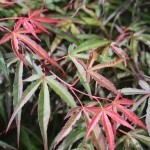 Prefers well-drained, acidic soil and some protection from summer sun. This is an introduction from Canada.